Need A Quick Repair On A Power Supply Unit? Repair Zone Can Do It! Send us your Sola power supply for repair and you will save time and money. Our technicians can quickly troubleshoot your Sola unit and have it back to you within a few days. This efficiency is possible because these are sent to us regularly from the automation plants we service. Therefore, your power supply will be in the hands of technicians that frequently repair Sola Power Supplies. This exposure also gives us the confidence to accurately evaluate, repair, and test your power supply--in a model specific test stand--so when it arrives back to you it's ready to go. Call today 989-922-0043 to receive expert repairs on your Sola Power Supply! 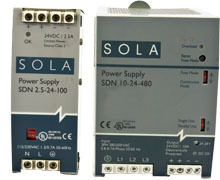 Or, browse our Sola Power Supply Inventory for repair, exchange, or purchase.